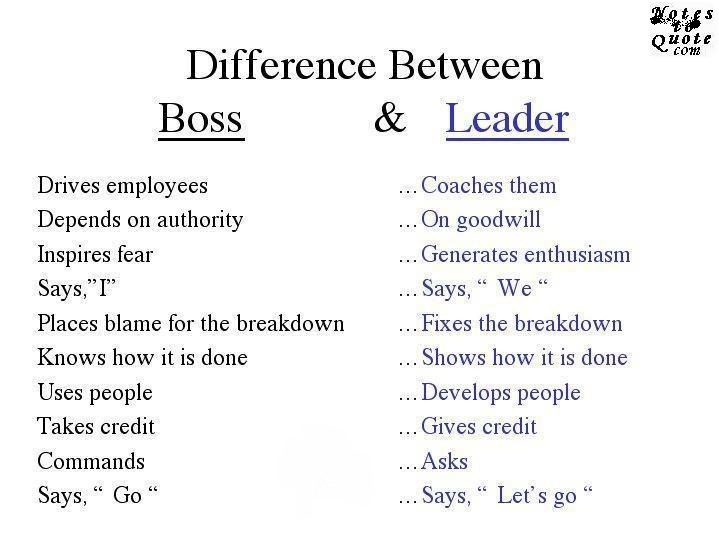 This is a super difference which really brings out the great characteristics and qualities of a real Leader against the evil selfish characteristics of a Bossy personality who live for himself and his inflated ego. 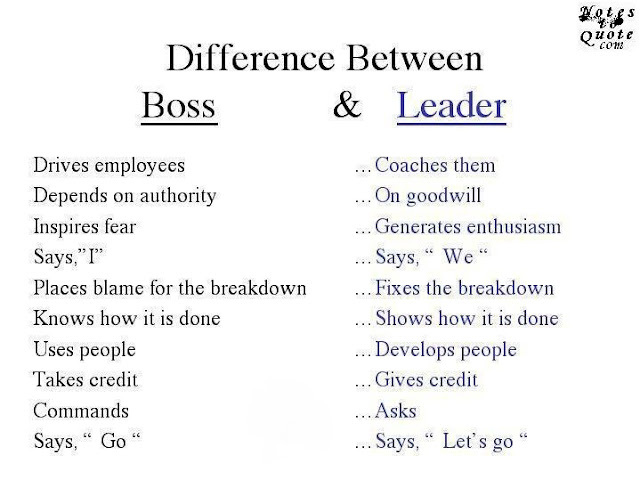 Through this comparision between a real Leader and a Boss, we can really understand what it means when Jesus said, "25 ...The kings of the Gentiles are deified by them and exercise lordship [ruling as emperor-gods] over them; and those in authority over them are called benefactors and well-doers. 26 But this is not to be so with you; on the contrary, let him who is the greatest among you become like the youngest, and him who is the chief and leader like one who serves. 27 For who is the greater, the one who reclines at table (the master), or the one who serves? Is it not the one who reclines at table? But I am in your midst as One Who serves." (Luke 22:25-27). The above reply of Jesus was given in the midst of a boiling situation, where an eager contention arose among his apostolic team of disciples as to which of them was considered and reputed to be the greatest (Luke 22:24). In the nature of man there is a inherent quality of sin nature and independency that does not want to submit to anyone, even to God Himself. This lack of submission to God breeds lovelessness over people and a prideful bossy attitude over a period of time. This nature can only be tamed to excellence of leadership when we take pains to develop a heart to serve people rather than be served by people. Even the secular world today is realising that a servant leader is the best person to inspire people to excel in any profession. If you have prayed the above prayer from your heart, I bet that in the coming days, you are going to be the greatest among the people of God. God will lift you up and exalt you with a great anointing in His time to make you a life giving minister in this generation of spoiled bossy ministers of God who live a soulish life of disobedience toward God (1 Peter 5:6). LEARN TO EXCEL IN SERVING PEOPLE AS SERVANT LEADER BY DEVELOPING THE SKILL TO STAY HUMBLE BY GIVING GOD THE ACKNOWLEDGMENT AND GLORY FOR ALL THAT GOD WORKS OUT THROUGH YOU IN YOUR LIFE AND MINISTRY. When you choose to become small by serving people, you are actually becoming great in the sight of God who wants to make you an eternal excellence before people in the days to come. ..•.¸¸•´¯`•.¸¸.ஐ [ www.apostolicrevelation.blogspot.in ] ஐ..•.¸¸•´¯`•.¸¸.